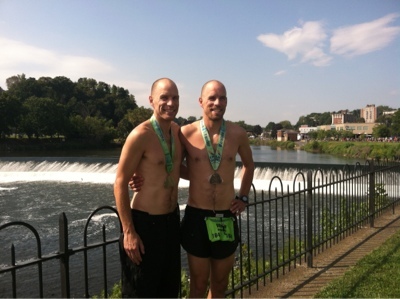 This past weekend we drove down to Allentown, PA for the VIA Marathon. 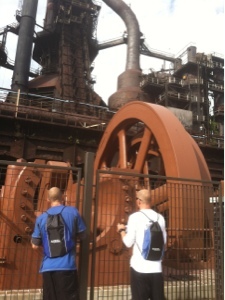 Our first stop was the expo, which was at Steele Stacks in Bethlehem. They were amazing to see. After checking in at our motel, it was time to eat. Eating out is always a gamble when traveling. Next to our motel was this tiny little place named Little Italy. I was a bit apprehensive to eat there. However it turned out to be the best choice we could have made. Ward and Wade had their pasta and I was completely in love with my choices. I indulged in some Yuengling and Stromboli. I may have eaten too much especially considering I was not running a marathon or any significant distance at all over the weekend. Oh well! We only make it to Pennsylvania once or twice a year so I have to just let go and enjoy. Right? 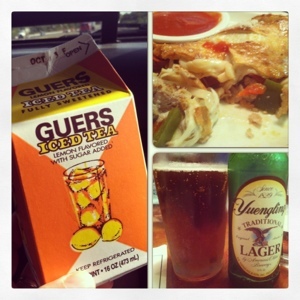 The Guers Iced Tea wasn't from dinner but I had to post about it because it is a childhood favorite of mine and it is definitely required to to get a couple of them when we visit the area. I'm actually enjoying this Guers right now as we drive back to Maine while I blog in the passenger seat and while Wade and Izzy nap in the back. Back to the marathon story. We got up super early Sunday morning, swung by the closest Dunkin Donuts, then headed off to Lehigh Valley Hospital. It was a bit tricky getting there. First we were stuck in traffic on the first highway after leaving the hotel. We decided to take the exit and just find another route. As many others were doing. Which worked like a charm until we got about a mile from the exit to the hospital- which was where the starting line for the race. Traffic was at a standstill and we were definitely not going to make it. It was about 6:25 with a start time of 7:00. We kept seeing cars with marathon stickers pass us on the right. Hoping they knew something we didn't we got out of the line and followed them. 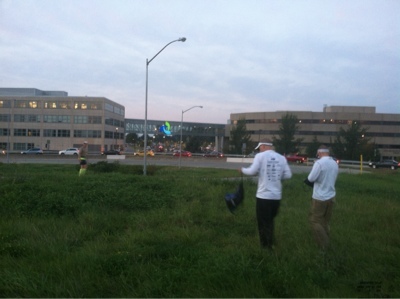 That's when we saw cars pulling over right at the exit with runners jumping out of the cars and walking to the start. The guys quickly decided they were doing that as well so we pulled over, they grabbed their bags and off they went. After they walked off I thought. Now what? Based on the long lines in both directions getting off the highway I knew the starting line was not an option. We headed off to the next exit so I could find a place to pull over to check out the course map. I found a location that seemed accessible so off we went. By luck we stumbled upon a barricaded road which meant MARATHON! Izzy and I got out and walked down the hill and we found ourselves at a water stop approximately at 4.5 miles into the race. We only waited a few minutes before we saw the first runner, cruising along. Then came a few more runners and then waves of runners. Izzy and I were standing on a large rock which gave us a great advantage to see the guys. Soon we saw the guys. We were so excited to see them! After they passed us, Izzy and I were off to the truck to try and find the next possible spectator spot. We decided to head off to mile 12, which was where my dad and Barb were. After getting lost a few times and rerouted due to road closures, we finally found it. We parked behind another car from Maine with a Sugarloaf sticker on the back. Thankfully I brought the jogger so Izzy jumped in, I grabbed some water bottles and fuel and off we went In an all out sprint. According to my calculations the guys were going to be there soon and I couldn't miss them. We found my dad and Barb in no time. 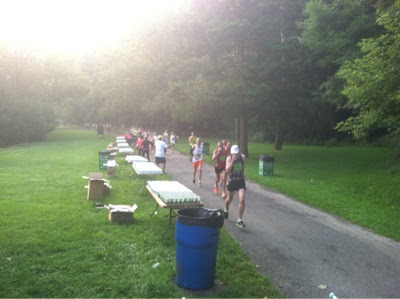 Then we started seeing runners we had seen at the last stop and knew the guys were going to be arriving shortly. When we saw them we cheered as loudly as we could and handed them some water. I was rewarded by having a sweaty tank and sweaty visor tossed to me. Gross! The best part about this spot was that runners did a little loop and came back past us again. This time I had another sweaty tank tossed at me. Again, gross! 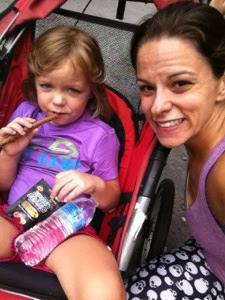 After the guys passed by, Izzy and I sprinted back to the truck and off we went to mile 20. When we finally arrived at mile 20, we had to park about a mile away. After we loaded up the jogger with more water and fuel, Izzy and I took off for the course. There were only a few other spectators there. Soon after arriving I noticed some of the racers I saw just before the guys at the other stops so I felt relieved I hadn't missed them. We did see a racer sporting a Bowdoin singlet and had to cheer for him. Then we saw the guys and offered them fuel or water. Wade grabbed a water and off they went up a challenging uphill of loose gravel. We ran back to the truck and headed off to the finish. This time we found our spot with zero issues. We even found a parking spot super close to the finish area. We found dad and Barb in no time. As the guys expected finish time approached, I started getting nervous so I had Izzy stay with my dad and Barb and I started running the reverse of the course looking for the guys. I found Ward first and then Wade. I cheered them on and ran back to my family. The guys didn't perform where they had hoped but still worked hard, tried their best and completed another marathon. They both amaze me with their running abilities. I am incredibly proud of the both of them. After this we walked down to the river and they guys washed off a bit. Which I quite grateful for so I wouldn't have to smell their stink in the truck. Izzy even took a little dip. Ward and Wade both said the course was gorgeous. 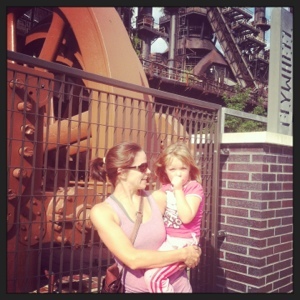 It mostly followed the Lehigh River and canal. It was a closed course and included a lot of trails. Maybe someday I will run it. If I ever return back to marathons. But there is also a VIA Half, so maybe that would be an option. 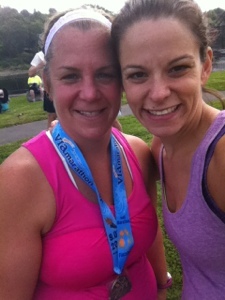 And in all of the excitement of the marathon, I even spotted Michele, a fellow blogger and Instagram pal. It's so fun to meet other bloggers in person! This course wasn't the easiest to spectate. The course was closed and the map was really only made for runners. 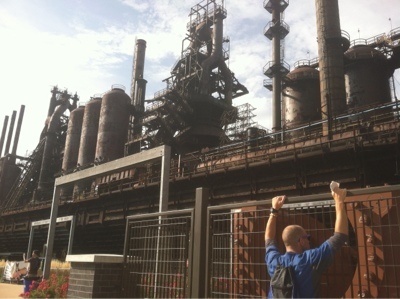 I was completely out of my element and had zero idea how to navigate through Allentown, Bethlehem, and Easton. I'm amazed I didn't miss the guys at all. However, I will say I prefer to be a marathon spectator right now. 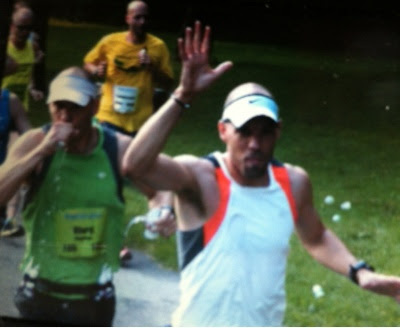 It was fun seeing them and cheering them on and other runners - even if I had zero clue where I was going. Thank goodness for my iPhone and the map app. I've never heard of that iced tea but will have to keep an eye out for it! Spectating is definitely a sport all of its own. Spectating is so much fun, but can be tricky to do if the course is closed! Congratulations to Wade and Ward! 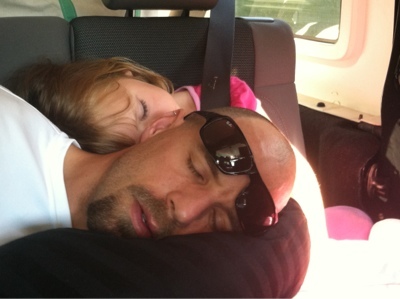 That backseat photo is so cute! Looks like a great race. Eww on the sweaty tank tosses. They are quite amazing - and how nice to be able to share this sport with each other. I love spectating races too although you needed to drive around I generally pick a spot and stick to it as I've never had to second anyone with fuel before. SOunds like a really fun weekend! I agree: spectating can be quite arduous! Just awesome! That pic of Izzy and Wade is priceless! 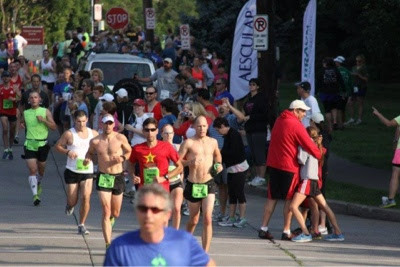 I actually live in Allentown and have participated in this race for five years. I ran the half, volunteered when I was pregnant and I ran the marathon relay with my team the rest of the three years. Check out the relay. It's a great time. The course IS beautiful, but an absolute mental challenge given the volume of spectators along the way.